ALL the side streets off 5th Avenue, from the 40s up to 63rd, were lined with trade union banners, trucks, floats, food stalls and (most importantly on a day when temperatures hit 98) huge barrels of ice holding bottles of water and soft drinks . It was New York’s Labor Day Parade, held on the Saturday after Labor Day, 5 September, the US equivalent to May Day. As the different unions lined up to join the event all along 5th Avenue they were accompanied by colourful floats and buses filled with members and their friends and families on this big, vocal, upbeat parade. The marchers chanted their union slogans as more and more contingents poured out of the side streets to join in. There were the labourers of LiUNA in their bright orange T-shirts with the message “Feel The Power”, and the electricians, IBEW, headed by the Local 3 Sword of Light Band, all wearing pink baseball caps to honour “The Year of the Woman”. The plumbers, carpenters, ironworkers, Teamsters and the Transportion Workers’ Union Quill/Connolly Local 100, sheet-metal workers, pipe insulators, steamfitters, painters and others were there too, all represented with banners and placards, slogans and T-shirts. This year’s Grand Marshal was James Callahan, General President of the International Union of Operating Engineers, who proudly led the parade. 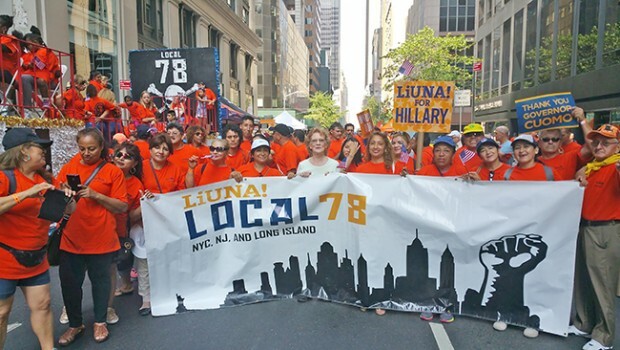 This was a loud, proud, energetic march and quite moving in the clear commitment of these union members. These men and women and children, young and old, all had a place and were involved in celebrating Labor Day and the rights of workers.